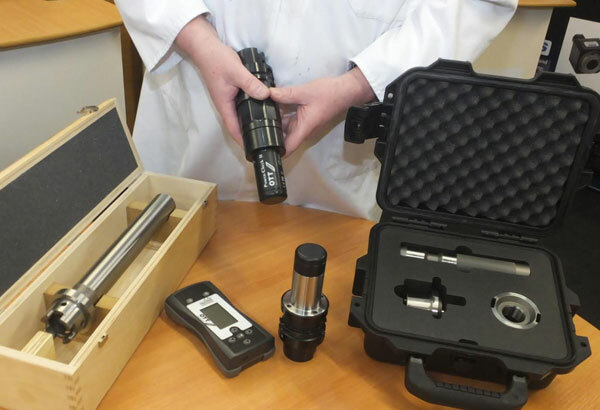 Making use of specialist monitoring equipment from partner OTT-Jakob and components from its own toolholding inventory, Gewefa UK has developed a new ‘kit of parts’ for those involved in machine tool maintenance and servicing. Degradation of internal components such as spindle bearings and the spindle pull back mechanism will impact over time on precision of the workpiece being machined, in the same way as tool wear. As such, spindle performance monitoring is vital either as a regular routine performed by the operator or undertaken by third party servicing experts. Using the right test equipment is essential and by combining the latest OTT-Jakob Power Check spindle pull force measuring gauge combined with high precision Gewefa test bars and alignment kits, monitoring spindle performance and servicing is now a straight-forward and precision guaranteed operation. The Power Check is a highly adaptable component that can be used as a portable service tool or, in larger machine shops, can be permanently located (exactly as a toolholder) in the carousel to supply on-going data on spindle condition. The connection to the hand held data collector is wireless so an operator can monitor data collected at the machine from up to eight different machine locations. Over 8,000 readings can be stored on the handset with these easily downloaded to a USB for transfer to a lap top or network computer system. The other components of the monitoring kit are from the Gewefa inventory. Gewefa offers an extensive range of test bars covering sizes in DIN, HSK, VDI or BT spindle formats. In the monitoring process they are used to check the spindle run out and can be supplied with a flange or in plain format. All Gewefa test bars are precision ground for a combination of precise surface finish and concentricity and are supplied with test certificates. taper/flange/shaft and bush – the components are supplied in a bespoke tool case for safe storage and transportation.